The 150-year-old Museum of Archeology in Krakow (Muzeum Archeologiczne) is home to the world’s only Slavonic god that has ever been unearthed, the 8-foot-tall stone idol of four-faced Swiatowit found in the Zbruc riverbed in 1848. Yet it’s just the best known artifact among the museum’s many unique exhibits, often truly spectacular, that offer a glimpse of mysterious ancient peoples once commanding the eastern half of Europe. 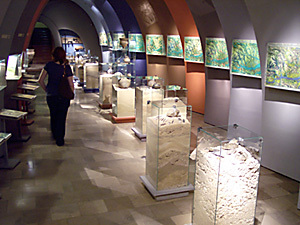 Krakow’s archeological museum consists of two permanent shows. Its main exhibition called ‘Malopolska in Prehistory and the Early Middle Ages’ covers 70,000 years from Neanderthal cavemen to the Scythians to the early-medieval Poles. The other major permanent show, ‘Gods of Ancient Egypt', displays a collection of Egyptian antiquities. The museum has also become known for interesting and ingenious temporary exhibitions. Historical building of Krakow’s archeological museum. The present seat of the Museum of Archeology in Krakow, situated at 3 Poselska street next to Planty gardens, is an important monument in its own right. A 14th-century fortress and next a posh medieval palace, once known as ‘The Painted Mansion’ (Malowany Dwor) was turned into a Carmelite monastery in the 17th century. Then it became an infamous Austrian prison in the 19th century. The museum boasts a pleasant garden. Contact info for the Museum of Archeology in Krakow. Postal address: Muzeum Archeologiczne w Krakowie, ul. Poselska 3, 31-002 Krakow, Poland. From September through June the Archeological Museum in Krakow is open on Sundays from 11 a.m. to 4 p.m., Mondays from 9 a.m. to 3 p.m., Tuesdays from 9 a.m. to 6 p.m., Wednesdays from 9 a.m. to 3 p.m., Thursdays 9 a.m. to 6 p.m., and Fridays 9 a.m. to 3 p.m. In July and August the museum stays open Sundays from 10 a.m. to 3 p.m., Mondays from 10 a.m. to 5 p.m., Tuesdays from 10 a.m. to 5 p.m., Wednesdays from 10 a.m. to 5 p.m., Thursdays 10 a.m. to 5 p.m., and Fridays 10 a.m. to 5 p.m.
Closed on Saturdays. Free admission on Sundays. Regular tickets are priced at 12 zloties, reduced ones cost 7 zloties. Copyright © 2008 - 2017 by MAREK STRZALA. All rights reserved.